Six excavations (1987–2007) at Finsbury Circus on the north side of the City of London uncovered over 130 Romano-British burials, part of the upper Walbrook cemetery, to the west of the better-known ‘northern’ cemetery (around Bishopsgate). 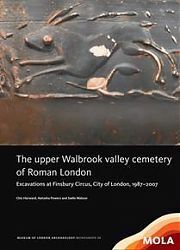 Set within an area of marginal land, traversed by meandering tributary streams of the Walbrook, the cemetery provides intriguing insights into the management of burial space and attitudes to the dead, and a solution to one of the most intriguing problems of London’s Roman archaeology – the origin of the ‘Walbrook skulls’. The cemetery was in use by the end of the 1st century AD, with most activity dated to c AD 120–200, but occasional interments continued into the 4th century AD. The majority of the graves are typical of the cemeteries of Roman London, but two individuals buried with heavy iron leg rings, apparently forged around the ankles after death are of special interest. What is remarkable about this cemetery is that human remains, particularly skulls, became exposed, were washed out and transported downstream by floods, migrating Walbrook tributaries and drainage channels. That burial continued in such conditions suggests either that this watershed area (and the taphonomic transformations on display) held significance for those using the cemetery, or that their choice of burial location was restricted. Copies of the book (price £25.00) can be ordered from MOLA here.